A classic car as special as yours deserves a special kind of insurance policy. That's where Adrian Flux could help. With over 40 years experience in arranging insurance for every car imaginable – and some you probably couldn't imagine – we can tailor a classic car policy as unique as your vehicle. We know that owners of classic cars are not like other motorists and the classic car insurance cover we arrange can take this into account. What constitutes a classic car can sometimes be a matter for dispute, but you will find that we have a broader definition than most of our competitors, which includes cars as young as 5 years old. We could arrange great cover whether your car is a Vauxhall VX220, Austin Seven or even a trusty Ford Cortina, Hillman Imp, Morris Marina, MGB or something made by Alfa Romeo, Jaguar, MX5, Triumph and Opel including the Manta. 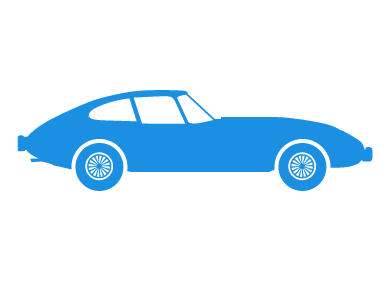 Agreed value cover – many insurers will only pay out the 'market value' of your classic car if you suffer a total loss. We could assess your car and agree cover for its true value, so you won't get a nasty surprise if you need to make a claim. Laid up policies – so your classic projects are fully protected from theft or mishap. Limited Mileage discounts – the fewer miles you drive, the more you can save, from as little as 1,500 miles. Because classic cars tend not to be driven every day, most schemes incorporate a limited mileage element. Unlike many of our competitors, however, we could also offer insurance for people who use their classic car more frequently. Wedding Hire cover – could be arranged on application. Track Day / Rally cover – could be arranged on application, depending on the policy taken. Owner's Club Discounts – If you belong to a recognised classic car owners club or enthusiasts' forum, you may receive a discount of up to 15%, depending on the policy taken. Practical Car Magazine - If you are a Practical Car reader, you may be entitled to a discount. Jaguar Clubs - Substantial discounts on all car, motorcycle and home insurance purchased for all Jaguar Enthusiasts Club. Our experienced sales staff are knowledgeable in classic car insurance and will calculate your premium individually, using their expert knowledge of the many classic insurance schemes on offer. When you call us you will be speaking to a knowledgeable enthusiast, based in the UK, rather than a computer rate from a foreign call centre, which doesn't know a Morris Marina from a Vauxhall Viva. Quicker & Cheaper rates by phone – please complete the call me form during office hours 9am to 7pm Monday to Friday & 9am to 4pm Saturday for an immediate classic car insurance quote. * On a like for like basis, subject to normal underwriting acceptance. Click the button to visit our customer portal where you can make changes to your policy, view policy documents, make a payment, and find out information about us. Can't find what you're looking for? Give our team a call on 0344 381 6502 and we'll be happy to help.